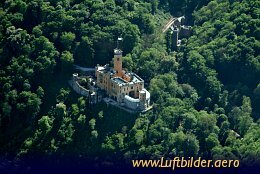 Mouse castle was built in the 14th century. 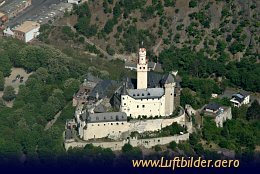 It got is name from the counts of Katzenelnbogen, who built their Burg Neukatzenelnbogen - also called Cat Castle (german: Burg Katz) - in the vicinity. 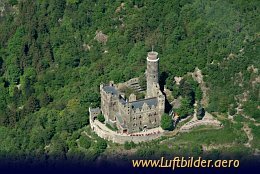 Stolzenfels castle was built in the 13th century, was destroyed in 1689 and rebuilt as an royal castle by Friedrich Wilhelm IV of Prussia in 1826.